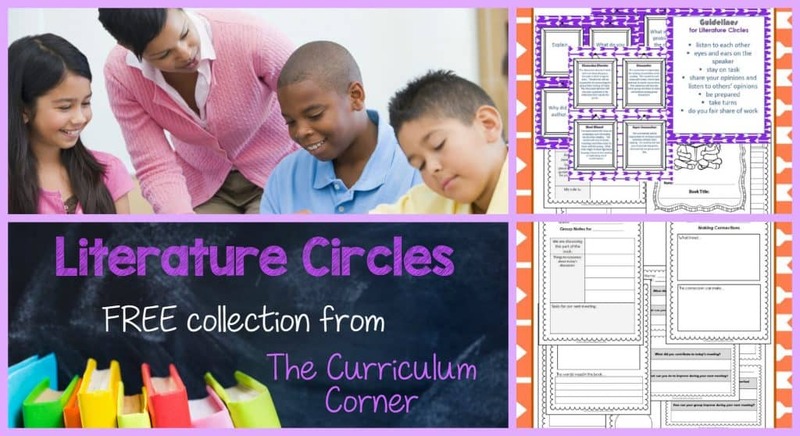 This collection of resources is designed to help you organize and implement literature circles in the classroom. When planning to begin literature circles in your classroom, it is helpful to have a collection of resources to get you started. We have compiled an assortment designed to make the process easier for you. To you have suggestions for additions? We would love for you to share your ideas below! You can download the complete, free collection by clicking on the bold, purple words at the bottom of this post. Literature Circle Planning Page Designed for the teacher. This page is a page you can use to divide students into their groups, record the book and other notes. Guidelines Anchor Chart Includes guidelines for your class to follow when meeting with their groups. It is important for this anchor chart to be a part of classroom discussion so that students understand the expectations. Even better, use the blank one we have provided and work with your students to create your own class set of guidelines. Literature Circle Jobs Cards These four cards give the name of each position and describe what is expected. It is important for the teacher to model each job before children are expected to perform each task. Discussion Cards These can be used by the discussion director or in other ways as needed. Includes 12 questions designed to get students thinking about their reading. Literature Circle Guide Cover Page This can be used if you plan on putting the student pages into a booklet. Literature Circle Introduction A place for students to record their group members, book title and other important information. Literature Circle Reading Plan Students record the dates they will be meeting and break the book into sections. Discussion Director The director plans the meeting by recording five strong questions for the reading. Word Wizard The wizard records five words or phrases along with the meaning to prepare for the group discussion. Connector The connector records what happened in the book and then shares the connections made. Super Summarizer There are two different pages the teacher (or summarizer) can choose between. Group Notes You might choose to have one student (the summarizer or director) complete this page after each meeting. Or, you might have each student complete during each meeting for practice with note taking skills. Making Connections A page where students can record a connection for the book. Visualizing A simple page for students to share what they read and then illustrate their thoughts. Exit Tickets There are two different styles designed to have students reflect on their performance. These might be used when you need to work to get your students back on track. We suggest following this task with a small group or whole group discussion. Job descriptions Not all teachers who use a literature circle approach choose to assign roles. Depending on your classroom dynamics, assigning roles can lead to students feeling like their only job is the assigned task. Some students focus only on their job and withdraw, not contributing to group discussions. If you are concerned this will happen in your classroom, you may choose to assign group tasks as opposed to individual roles and tasks. Close Reading: Focus on Process This post includes information on using think marks while reading. Think marks might be a useful tool for your students to use when preparing for their literature circle discussions. Thank you for the lit circles resources – saves so much time when we don’t have to re-invent the wheel. Much appreciated. This was so generous to share for free. I’ve been daunted by implementing “lit circles” and this makes it doable for me! TY! Do you happen to have these resources in Spanish? So very sorry, Hannah, but we don’t. Neither of us speaks Spanish, so the resources we do have in Spanish…we have had to hire someone to create them.